Former IAM Headquarters GVP Rich Michalski has retired after over four decades of service to the Machinists Union. Recently-retired IAM Headquarters General Vice President Rich Michalski has been publicly recognized by two members of Congress for his long career of service to the IAM, the labor movement and working families. Michalski became a familiar face in the halls of Congress during his 45-year career with the IAM, promoting legislation that preserved the American Dream and vigorously opposing bills that hurt IAM members. During remarks on the U.S. House of Representatives floor, Rep. Ed Pastor (D-AZ), a long-time friend of Michalski, lauded the work Michalski did to counter the anti-union and anti-labor agenda. 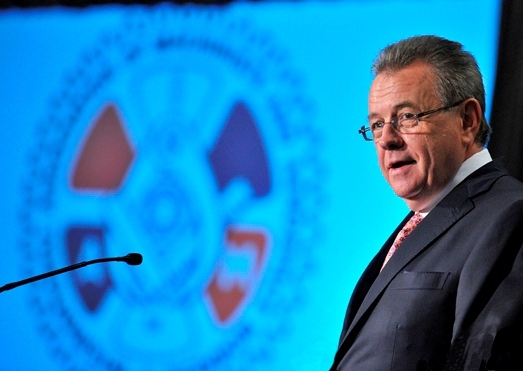 Michalski rose from positions at his local lodge including Steward, Chairman of the Bargaining Committee, and President to become the IAM’s Director of Legislative and Political Action in 1992. He also served as the Director of the Machinists Non-Partisan Political League (MNPL) and was appointed Headquarters GVP in 2006.